We just got our new tennis business cards in. We simply put a tennis ball on a round card and put in the info. A good graphics person can “fatten” up the middle of the text to make it look like it’s on a round ball even though it’s obviously a flat card. 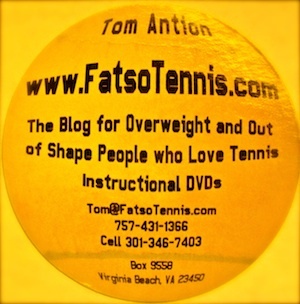 Tennis ball business cards are a great way to show off your fanaticism for the sport. Talk to your printer or look for “round business cards” on line. I think you might need to modify a bit the text at the edges and use another font! In person it looks pretty good. It actually looks like it is a round ball.